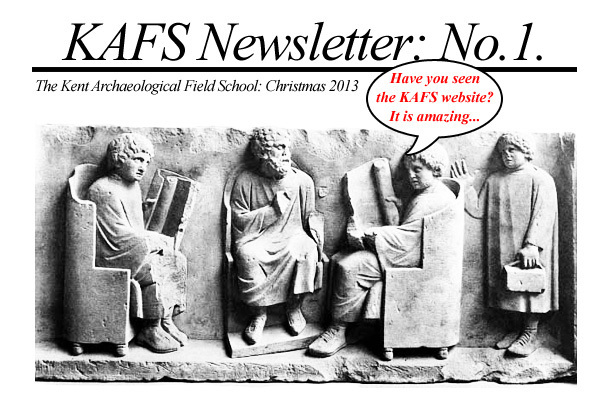 We will be sending a Newsletter email each month to keep you up to date with news and views on what is planned at the Kent Archaeological Field School and what is happening on the larger stage of archaeology both in this country and abroad. Talking of which we are extremely lucky this year to be able to dig with the University of Texas at Oplontis just next door to Pompeii. Also this year we have been invited to participate in excavations at Ostia, the port of Rome, so book early to avoid disappointment. Our next big report to write is the work we have done in Syndale Park from 2003-2011. 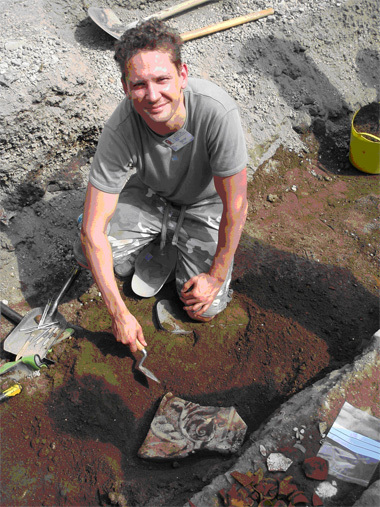 In 2003 KAFS was invited by the trustees to investigate the park with a view to informing on the extent and quality of the archaeology surviving in the park. 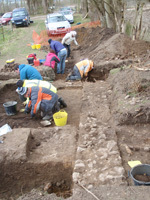 What we have uncovered in geophysical survey and limited excavation has shed new light on the nature and extent of monuments within the park, which in turn has led to a wider investigation of the land north and south of the Roman Watling Street (below) which itself runs east-west through the park. The Roman fort and Roman small town of Durolevum have been located and on the brow of the hill a large Late Iron Age settlement exposed by evaluation. The study area lies within a rich archaeological landscape. To the west the standing remains of Stone Chapel and to the east the remains of the Anglo-Saxon cemetery in Kings Field. The Roman road running through Syndale Park, also showing is Roman buildings which are part of the small town of Durolevum. We have a full programme of courses which can be seen below. To become a member or to book see â€˜Contentsâ€™. Archaeologists have discovered an extraordinary Roman sculpture in the form of an eagle firmly grasping a writhing serpent in its beak. The find was uncovered on a site in the City of London, ahead of development of a 16 storey 291 bed hotel by Scottish Widows Investment Partnership (SWIP) and its development partners Endurance Land. 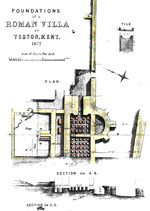 The team from MOLA (Museum of London Archaeology) were at first hesitant to announce the discovery and to proclaim its Roman origins, owing to its almost unbelievable condition. Described by experts as â€˜amongst the very best statues surviving from Roman Britainâ€™, the skill of the craftsman is apparent; with the forked tongue of the snake and the individual feathers of the eagle still clearly discernible today. Some 65cm tall and 55cm wide, the sculpture is made from oolitic limestone from the Cotswolds. A well-known and celebrated school of Romano-British sculptors worked in the area but to date examples of their exquisite work has been scant and fragmentary. The sculpture will go on display for 6 months at the Museum of London from the 30th of October 2013 so that members of the public can see this rare and remarkable piece in all its glory. The Treasure Valuation Committee recommended the value of Â£3.285 million to the Secretary of State and this has now been agreed withBirmingham and Stoke City Councils as well as the finder and landowner of the Hoard. 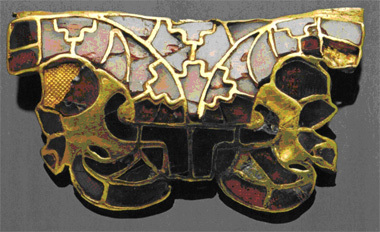 On 23 March 2010 The Art Fund announced that the Staffordshire Hoard has been saved for the nation. The news came after the National Heritage Memorial Fund (NHMF), the government's fund of last resort for heritage items at risk, pledged Â£1,285,000, bringing the campaign to the Â£3.3m target, just over three weeks ahead of schedule. Less than a week after the fundraising campaign was launched, the newly-found artefacts from the Staffordshire Hoard have been saved for the nation thanks to the generosity of the jewellers Wartski who made the Duchess of Cambridgeâ€™s wedding ring. 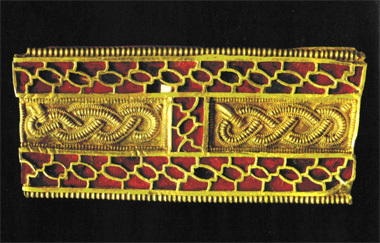 Recently the Court Jewellers Wartski donated the full amount needed - Â£57,395 â€“ in order to purchase the 81 additional pieces of Anglo-Saxon treasure that were found last November in the same Staffordshire field as the initial 3,500-piece collection. Wartski is a family jewellery business in London. To join the â€˜behind the scenesâ€™ visit with KAFS email your interest to info@kafs.co.uk or log on to our web site to reserve a place in 2014. 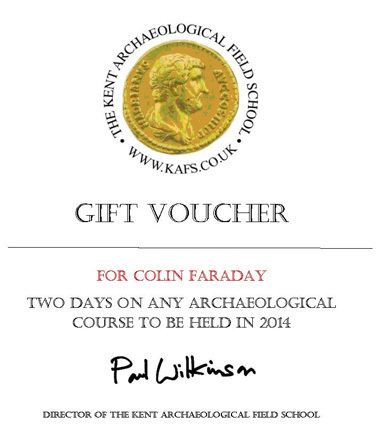 You can buy Gift Vouchers from KAFS for Â£25 a day in one, two or five days. Pay online at www.kafs.co.uk and an e-voucher will be sent to you-Merry Christmas! If you wish to book for week 1 or 2 on the following Field Trip: Oplontis Roman Villa B, Pompeii, Naples, in association with the University of Texas. Please note food, accommodation, insurance, and travel are not included. Flights to Naples are probably cheapest with EasyJet. To get to Pompeii take a bus from the Naples airport to the railway station and then the local train to Pompeii. Hotels are about 50eu for a room per night. We are staying at are the Motel Villa dei Misteri and the Hotel degli Amici. info@villademisteri.it info@hoteldegliamici.it For camping (where I shall be) the site Camping Zeus is next to the hotel: info@campingzeus.it and is about 7eu a night. Transport to Oplontis from Pompeii can be provided. Please note it can be hot so bring sun cream and insect repellent! Any queries email me at info@kafs.co.uk or in Naples call my mobile on 07885 700 112. In 64 BC Zeugma was conquered and ruled by the Roman Empire and with this shift the name of the city was changed into Zeugma, meaning "bridge-passage" or "bridge of boats". During Roman rule, the city became one of the attractions in the region, due to its commercial potential originating from its geo-strategic location because the city was on the SilkRoad connecting Antioch to China with a quay or pontoon bridge across the river Euphrates which was the border with the Persian Empire until the late 2nd century. In 256, Zeugma experienced an invasion and it was fully destroyed by the Sassanid king, Shapur I. The invasion was so dramatic that Zeugma was not able to recover for a long time. To make the situation even worse, a violent earthquake buried the city beneath rubble. Indeed, the city never regained the prosperity once achieved during the Roman rule. Zeugma and environs remained part of the Roman Empire. During the 5th and 6th centuries the city was ruled by the Early Byzantium or Eastern Roman Empire. As a result of the ongoing Arab raids the city was abandoned once again. Later on, in the 10th and 12th centuries a small Abbasid residence settled in Zeugma. Finally a village called Belkis was founded in the 17th century. In 64 BC Zeugma was conquered and ruled by the Roman Empire and with this shift the name of the city was changed into Zeugma, meaning "bridge-passage" or "bridge of boats". During Roman rule, the city became one of the attractions in the region, due to its commercial potential originating from its geo-strategic location because the city was on the Silk connecting Antioch to China with a quay or pontoon bridge across the river Euphrates which was the border with the Persian Empire until the late 2nd century. In 256, Zeugma experienced an invasion and it was fully destroyed by the Sassanid king, Shapur I. The invasion was so dramatic that Zeugma was not able to recover for a long time. To make the situation even worse, a violent earthquake buried the city beneath rubble. Indeed, the city never regained the prosperity once achieved during the Roman rule. During the Roman Era, the Legio IV Scythica was camped in Zeugma. For about two centuries the city was home to high-ranking officials and officers of the Roman Empire, who transferred their cultural understanding and sophisticated life style into the region. 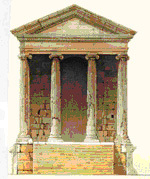 Thus the military formation acquired a Roman character and gave rise to an artistic trend of necropolis sculpture. In this respect, samples of beautiful art appeared in the form of steles, rock reliefs, statues and altars. This unique trend in sculpture and art made the newly emerging Zeugma art well recognized in whole region. Zeugma became considerably rich, owing to the liveliness created by Legion formation. At that time, there was a wooden bridge connecting Zeugma to the city of Apamea on the other side of Euphrates, and current excavations revealed that there was a big customs and a considerable amount of border trade in the city. 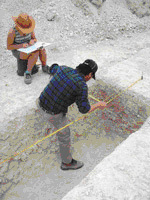 The proof for this assumption came from the findings in the excavations carried out in â€œIskele Ã¼stÃ¼â€�. In this site, 65,000 seal imprints (in clay, known as â€œBullaâ€�), were found in a place which is believed to serve as the archives for the customs of ancient Zeugma. The seal imprints used in sealing papyrus, parchment, moneybags, and customs bales are good indication of volume of the trade and the density of transportation and communication network once established in the region. In 1987 the Gaziantep Museum excavated two tomb chambers which had been broken into by antiquity smugglers in the necropolis southwest of Zeugma, revealing frescoson the walls and statues on the terraces in front of the chambers. These statues are now in the Gaziantep Museum of Archaeology. In 1992 the watchman at the site, Nusret Ã–zdemir, reported renewed illegal activity here, and a trench dug by antiquity hunters was discovered in the centre of the city. Excavations commenced on the same spot by a team from Gaziantep Museum led by director Rifat ErgeÃ§ uncovered a Roman villa and magnificent mosaic pavements. The 1st century AD villa consisted of galleries around an atrium with eight columns and rooms behind the galleries. The mosaic which adorned the villa's gallery depicted the marriage of Dionysus, god of wine and grapes, to Ariadne. Sadly, six of the ten figures portrayed in this mosaic were stolen on 15 June 1998. 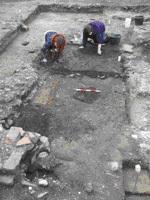 In further excavations here, in which David Kennedy from Australia participated in 1993, part of the central panel of the mosaic pavement belonging to the terrace of another villa turned out to have been stolen long since - probably around 1965 - so the two figures are missing from the knees upwards. The missing mosaic fragment was later found to be in the Menil Collection at Rice University in the city of Houston. The two figures seated side by side in this mosaic are the two legendary lovers, Metiokhos and Parthenope. At the request of the Turkish Ministry of Culture, the stolen fragment was returned, and the complete mosaic can now be seen in Gaziantep Museum. When mosaic fragments were discovered during construction of the Birecik Dam wall which commenced in 1996, Gaziantep Museum had the work halted while excavations were carried out that revealed a Roman bath and gymnasium, and 36 mosaic panels which were added to the museum collection. In 1997, on the clay quarry area in front of the dam wall a large Bronze Age cemetery was discovered and excavated. Nearly eight thousand pottery vessels were found in 320 graves going back to the early Bronze Age. The museum staff worked unceasingly through the winter of 1998-1999, uncovering such important and beautiful finds as the Akratos and Gypsy Girl Mosaic and 65,000 bulla (seal imprints in clay) in an archive room at Ä°skeleÃ¼stÃ¼, making Gaziantep Museum possessor of the largest bulla collection in the world. 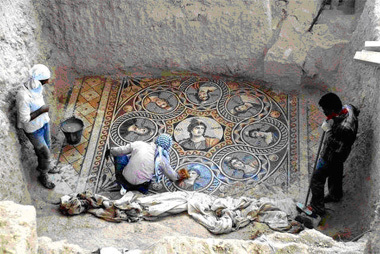 In 1999, in a building in the lower quarter of the city, mosaics depicting the head of Dionysus and Oceanus and Tethys with sea creatures were discovered. From 1996 onwards, with the threat of being submerged under the waters of the new dam, salvage excavations were carried out by C. Abadie Reynal of Nantes University in France together with archaeologists from Gaziantep and ÅžanlÄ±urfa museums. 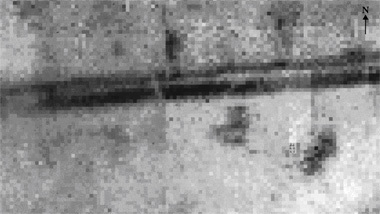 In 1999 a mosaic pavement depicting the mythological Minos bull was discovered at MezarlikÃ¼stÃ¼, and at the end of the excavation season further mosaics were visible at the thresholds of other rooms. Not wishing to leave the mosaics at the mercy of the treasure hunters who are so active in the area, Gaziantep Museumâ€™s acting director Fatma Bulgan decided to carry on with excavations through the winter months. Despite difficult weather conditions they went on to uncover a fountain with its own tank at a depth of three metres, and a marble figure of Apollo, as well as another mosaic pavement with nine figures depicting Achilles being taken by Odysseus to fight in the Trojan War. Also during salvage excavations under Mehmet Ã–nal, an archaeologist from Gaziantep Museum, two more Roman villas were uncovered. These villas, which stood side by side, were burned and razed by the Sassanids in 252. The fact that they lay under three metres of rubble had protected them from treasure hunters, and their frescos, mosaics and other artifacts were almost completely intact. A bronze statue of Mars, which aroused increased media interest in Zeugma, was found amongst storage jars in the larder of one of the villas. Altogether seventeen mosaic pavements have been revealed in the villas, whose walls were decorated with colourful frescoes. Excavations of Zeugma have been divided into three areas, initial priority being given to salvage and documentation in Zone A, which sank under the dam waters in early July. Work then moved on to Zone B, which will be submerged in October 2000 when the dam water reaches its maximum level of 385 metres. Zone C, on the other hand, consists of the higher parts of the city which will not be affected by the new dam. Zeugma is one of the foremost of Turkey's archaeological and historic sites, and the attention focused upon it from all over the world will undoubtedly continue over the years ahead. â€¢ Archaeological Museum This local archaeological museum hosts some stunning mosaics excavated from the nearby Roman site of Zeugma. The museum, which also has a small cafe inside, is wheelchair accessible. â€¢ The Castle's Museum. It is a great opportunity to learn from the Turkish point of view what happened in the WWI, especially what concerns to the dissolution of the Ottoman Empire and the further occupation. The view from the top of the castle is amazing. â€¢ Kitchen Museum. Museum about Turkish traditional cuisine, food, ingredients, tools and bon tÃ²n. Very interesting. â€¢ Zeugma Mosaic Museum. Zeugma Mosaic Museum, in the town of Gaziantep, Turkey, is the biggest mosaic museum on the world, containing 1700m2 of mosaics.